Get three sets of numbers to play for $1 Add Combo for $1 to combine matches and win more! JACKPOT TRIPLE PLAY jackpots start at $500,000 and can roll over to up to $2 million if there isn't a jackpot winner. Once the jackpot reaches $2 million, and there is no jackpot winner, the excess money in the jackpot prize pool rolls down and increases the payouts on all of the lower-tier prize levels each drawing until the jackpot is won. Select or Quick Pick the first six numbers from 1 through 46 and the second and third set of numbers will automatically be Quick Pick. Each set of numbers prints on its own line and is played separately. For an extra chance to win up to $10,000 by combining winning number matches from all three sets of numbers, select the Combo box. Combo costs $1 more per play. JACKPOT TRIPLE PLAY with Combo tickets cannot be cancelled. To play the same numbers for more than one draw, select the number of draws you want to play in the Advance Play section of your playslip or tell the retailer how many advance draws you wish to play. Give your completed playslip and payment to the retailer. You will receive a ticket printed with your numbers and draw date(s) played. If you played multiple plays, each play will print on a separate ticket. Please check your ticket(s) before you leave the store. You are responsible for the accuracy of your ticket(s). Drawings are held Tuesday and Friday nights at 11:15 p.m. Eastern Time. Tickets may be purchased until 10:40 p.m. Eastern Time on the night of the draw. Tickets purchased after 10:40 p.m. will be for the next draw. The Florida Lottery will hold official JACKPOT TRIPLE PLAY drawings where six numbers from 1 to 46 will be drawn at random. You have three chances per ticket to win JACKPOT TRIPLE PLAY prizes by matching the winning numbers drawn in the official drawing for the date played. Win by matching three or more numbers on any one line to the winning numbers drawn. Match all six numbers on any one line to the winning numbers drawn to win the jackpot. *ALL JACKPOT TRIPLE PLAY prizes are pari-mutuel. **The Advertised jackpot prize will be paid in annual payments over 25 years, or as a single cash payment of a lesser amount. See game rules. ALL Combo prizes are set prize amounts. ***Free JACKPOT TRIPLE PLAY with Combo Quick Pick ticket good for the next available draw. 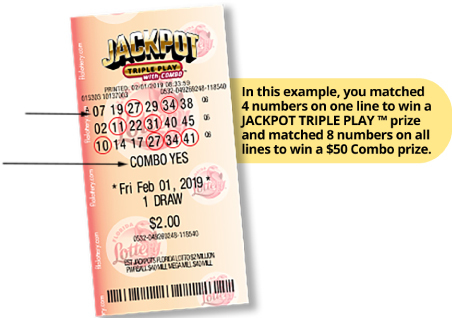 If no JACKPOT TRIPLE PLAY ticket matches all six winning numbers, the top prize pool rolls over to the next draw until it reaches $2 million. After the JACKPOT TRIPLE PLAY jackpot reaches $2 million and there is no jackpot winner, the amount in the jackpot prize pool in excess of the funds required for a $2 million annuity will roll down to increase the prize payouts on all of the lower-tier cash prizes. JACKPOT TRIPLE PLAY winners may choose to receive their portion of the JACKPOT TRIPLE PLAY jackpot in a one-time Cash Option payment or in 25 annual payments. The Cash Option payment is the amount required on the day of the drawing (or if the drawing is held on a holiday, the business day prior to the drawing) to fund the applicable jackpot prize over 25 years, less applicable taxes. JACKPOT TRIPLE PLAY jackpot winners who want to receive a single Cash Option payment must claim their prizes within the first 60 days of the 180-day redemption period. Applicable federal income taxes will be withheld from both Cash Option and annual payments at the time payments are made. Read more about claiming Lottery prizes. When you select Combo, players can combine matches from all three sets of numbers for an additional chance to win based on how many numbers match the winning numbers drawn. You can win up to four times on a single JACKPOT TRIPLE PLAY with Combo ticket.